That our markets are brimming with western toys reflecting other countries’ culture speaks volumes of their impact on us. Walk through the aisles of the toy section in markets, and you will see westernized blonde and brunette dolls with perfect adult body measures donning mini-skirts and revealing tantalizing legs and abdomen. For the longest time parents have cringed while buying such toys for their little girls but eventually they caved in. However, good news for parents, worried about suitable birthday presents, is that a Muslim doll is finally out on the shelves in markets. Heart of heart girls are 14 in total and Shola is one of them. Each doll has a different name and a story. The Muslim doll is made of plastic. She is pretty and dons a hijab. She represents our religion and culture. The doll name is Shola and she comes from Kabul Afghanistan. She is your little friend. The story of Shola is also interesting and purposeful. Shola has found inner peace for herself in the form of dolls and is focused on brightening the lives of other children hoping to see smile on their faces. Shola actually lives in Kabul with her sister Mehri where she spends her days in circus. She has lost her family. Shola and her sister Mehri have since found hope and peace by attending circus school. Together, they aim to leave Kabul to tour across Afghanistan where she will educate and entertain the children who have experienced sadness in their lives. We live in Muslim country where the impact of westernization is strong and seeing a hijab in women is unheard-of. When Shola was first introduced, it was not just refreshing but also culturally cool. The clothing of Shola is of great quality. Her hair is very soft silky and easy to comb. She has big doe-eyes. Hijab is the best trait of Shola which makes her prettier. 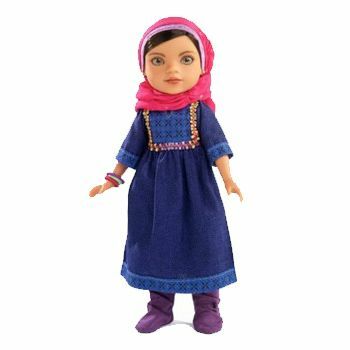 The Shola doll hit the shelves when Muslims are facing prejudice and judgment worldwide. It is a sad fact that Muslims are considered a threat across the world. There are many across the globe that sees people who appear Muslim as a sort of threat. Shola is the best way to show that Muslims are not a threat, but just followers of another peaceful religion and versatile culture. The purpose of making this doll is to empower girls to become agents of change in their communities and around the world. The best thing is that a portion of price of each doll is donated to nonprofit organization that helps the children from that doll’s country. The doll is not just specified for Muslim girls, it is for all little girls. No matter what tradition or religion one adheres to, buying or playing with Shola doll is one way to embrace diversity.